I HATE bending down to pick up balls. It is a hassle. It slows my practice down and ultimately decreases the amount of time I spend practicing. The Original Shag Bag Shagger is a god send. Using the Shagger enables the quick and efficient gathering of up to 80 golf balls. Any golfer who is serious about improving their golf game, especially short game, should own a Shagger and keep it full and in their car trunk. The Original Shag Bag Shagger is one of those simple, self-explaining tools. 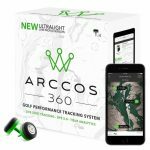 It enables golfers to pick up a large number of golf balls quickly and efficiently without bending over. It consists of a sturdy metal handle attached to a metal tube and heavy duty canvas storage bag. The Shagger holds up to 80 golf balls and weighs only 1.8 pounds when empty. The Original Shag Bag Shagger encourages golfers to spend more time practicing their short golf shots by taking the hassle out of gathering the balls. More comfort, less back strain, less hassle and more convenience means more enjoyment and time practicing your short game! An additional benefit of the Shagger is the amount of balls it can hold. Golfers can most effectively improve their golf games through focused repetition. 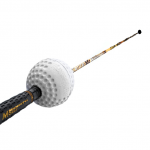 80 balls allows golfers to remain focused for a significant amount of time while gaining reps on a desired improvement. If you are trying to make a swing change, would you rather pull three balls out of your bag and then just hit three balls and fetch, hit three and fetch, etc. etc. etc. Or, would you rather have 80 balls at your feet for focused improvement. When I am practicing my chipping or pitching, 80 balls can last me up 20 – 30 minutes of focused repetitions. As simple as this golf ball shag bag is, we believe it is a must have for anyone who is going to spend time improving their golf game. For golfers who prefer a smaller, more portable golf ball shagger, we also recommend a golf ball shag tube. See our review here. See below to buy the Best Golf Ball Shag Bag!